It isn’t the end of the world, but you can see it from here. The plague of brain-chomping quasi-dead, previously discounted and denied, have become a genuine menace in several major cities. Every government has its own notions of how to deal with it, major corporations seek to manipulate the crisis, military leaders push against the limits of civilian control, and the zombies simply…hunger. 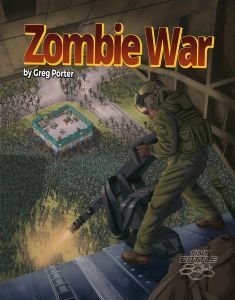 Zombie War is a 2-4 player game that takes the zombie threat to a global level. Each player has two hidden victory conditions and has to reach them using a rotating selection of roles, each with different powers and ways to gain victory points. In one turn you might be playing as the zombies, the next the government, the next the military, and finally the corporations. Yet, your victory conditions--for example, to infect three major capitals, or protect trade centers-- remain the same. The decisions you make as one role affect the other players, but may also affect you when you take on a different role in the next round. 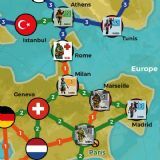 It is multiplayer mayhem on a strategic level. 1 x 22" x 17" richly-colored map of the world. 70 die-cut counters representing hordes of zombies, the medical personnel assigned to contain them, and the soldiers assigned to kill them. 18 victory condition, faction, and player aid cards.